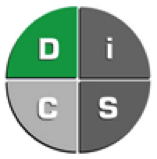 The DiSC model provides a common language that people can use to better understand themselves and to adapt their behaviours with others. This can be within a work team, a sales relationship, a leadership position, or other relationships. Facilitate better teamwork and minimise team conflict.